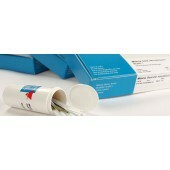 Milenia HybriDetect 2T is a ready-to-use, universal test strip (dipstick), which is based on lateral flow technology using gold particles. The dipstick is designed to develop qualitative or quantitative rapid test systems for the simultaneous detection of two different analytes such as proteins, antibodies, or gene amplifications. The user needs to develop two analyte-specific solutions, with following conditions. Solution A: Contains a first detector (e.g. antibody, antigen, specific probe) labeled with FITC and a second one (e.g. antibody, primer) labeled with biotin, and solution B: Contains a first detector (e.g. antibody, antigen, specific probe) labeled with FITC again and but a second one (e.g. antibody, primer) labeled with digoxigenine. The sample to be measured is mixed with the developed analyte-specific solutions, and then the dipstick isplaced into this solution. The complexed analyte (A)-labeled with FITC and biotin, binds first to the gold-labeled FITC-specific antibodies in the sample application area of the dipstick as well as the complexed analyte B (labeled with FITC and digoxigenine). The gold complexes A and B diffuse over the membrane by capillarity. Only the analyte captured gold particles will bound when they overflow the immobilized biotin-ligand molecules at the respective test band (test band A- analyte A, test band B- analyte B) and generate there a red-blue band over the time. Uncaptured gold particles flow over the control band and will be fixed there by species-specific antibodies. With increasing incubation time, the formation of an intensely colored control band appears. Please contact us if you would like to see the instructions for use for the Milenia Hybridetect kit.